Lake Powell in Utah has nearly 3 million visitors annually. Many people come to explore the 96 major canyons in the area, most of which can only be accessed by a watercraft. Lake Powell has 1,960 miles of shoreline – more than the length of the entire West Coast! This lake is more than 400 feet deep and the water ranges in temperature from 64 degrees to 84 degrees F. Nearby cities include Las Vegas, Cedar City, Duck Creek Village, Brian Head, Kanab, Salt Lake City, Springdale, and St. George. Stunning red-rock scenery surrounds the lake. Rock canyons and towers provide excellent photography opportunities. One famous national monument is the Rainbow Bridge. At 290 feet tall and 270 feet wide, it is the largest natural bridge in the world! The Lake Powell region is home to the Glen Canyon National Recreation Area, which spans hundreds of miles and houses museums such the John Wesley Powell Museum. People can take guided tours, hike, play paintball, or mountain bike while visiting this area. Free tours of the Glen Canyon dam are given throughout the week as well. There are also many archeological sites to explore such as Indian ruins, ancient buildings, and rock art. The rock art at Defiance House in Forgotten Canyon draws crowds of people every year. 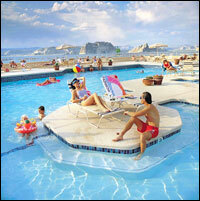 Tourists enjoy camping, biking, water skiing, hiking, kayaking, jet skiing, boating and fishing on Lake Powell. The predominant fish found in the lake are Largemouth & Smallmouth Bass, Striped Bass, Walleye, Catfish, Rainbow Trout, Crappie, and Bluegill. There are many national parks around Lake Powell. The Grand Canyon, Arches National Park, Bryce Canyon National Park, Canyonlands National Park, Capitol Reef National Park, Zion National Park, and the Escalante Grand Staircase National Monument are all located close to the lake. Lake Powell has quite a few marinas. Antelope Point Marina is on the southwest shore of Lake Powell. Its floating Marina Village has a full-service restaurant called Ja'di Tooh (meaning "Antelope Springs" in Navajo.) The marina has an assortment of houseboat and powerboat rentals, a launching ramp, a dry storage facility, and a fuel dock. There is also The Market Place retail store, which has groceries and other last-minute items you might need for your trip.